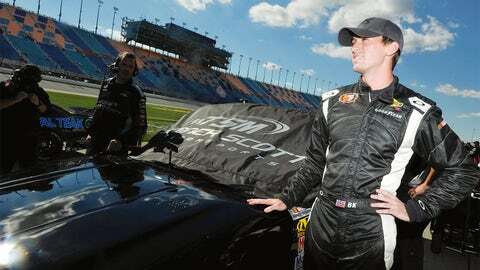 JOLIET, IL - SEPT. 13: Ben Kennedy, driver of the No. 30 Chevrolet, looks on during qualifying for the NASCAR Camping World Truck Series enjoyillinois.com 225 at Chicagoland Speedway on Sept. 13, 2013 in Joliet, Ill. It may be the holiday season for most people, but in NASCAR it’s still Silly Season. And Monday’s big news is that Ben Kennedy will drive full time for Turner-Scott Motorsports in the NASCAR Camping World Truck Series in 2014. Kennedy, 21, the great-grandson of NASCAR founder William Henry Getty France, will take over TSM’s No. 31 Chevrolet Silverado, which James Buescher won a Truck Series championship with in 2012. Crew chief Michael Shelton, who was part of Buescher’s championship campaign, will stay atop the pit box for Kennedy’s rookie season. Last year, Kennedy competed in five Truck Series races, with a best finish of fourth at Martinsville Speedway in the No. 30 TSM Chevrolet. Kennedy won Pro-Truck championships at both Orlando Speedworld and New Smyrna Speedway in 2009 and a Super Late Model title at Orlando Speedworld the following year, when he also made his debut in the NASCAR K&N Pro Series East. Kennedy began racing full time in the NKNPSE in 2011 and this past season finished fourth in the series standings with two wins, one pole, three top fives and nine top 10s. He was also selected as the Most Popular Driver in the series. Super excited to be driving in the 31 @TSMotorsports truck next year can't wait to see what possibilities are on the horizon! Welcome to @TSMotorsports @BenKennedy96 looking forward to working with you bud. "I’m really excited about the opportunity to be in Turner Scott Motorsports’ No. 31 truck for 2014 and to be able to work alongside Michael Shelton and a very talented crew," said Kennedy, who is also completing his sports management degree at the University of Florida. "It will be a great year and I hope to really learn a lot in the series and compete for wins and Rookie of the Year. It’s going to be a blast to work with such great people; I can’t thank everyone I’ve worked with in the past enough for getting me to this point in my career. A big ‘thank you’ to all my fans for always sticking behind me." Turner Scott Motorsports has earned two championships in the last two seasons, beginning in 2012 with Buescher’s NCWTS title. TSM captured the NKNPSE championship in 2013 with Dylan Kwasniewski. TSM’s Truck Series program totaled four wins, 10 poles, and finished the 2013 season with all three of its full-time trucks in the top 10 for the second-consecutive year.